In the first part of this series, I gave an overview of the Alteryx platform and some of the functionality offered by the SDK. The first parts of the SDK I am going to look at concern adding additional functions into the formula function library. There are two methods of doing this: XML Macro functions and C-style DLL functions. This post will take a look at first of these – XML Macro functions. This was the first part of the SDK I played with (not really realising the power of the SDK at that point), I came across them based on a blog by Adam Riley: FormulaAddIn (or 3Rd Floor Flat part 2). My early experimenting was to add some additional string conditional functions – StartsWith, EndsWith and (following Ned’s suggestion) Contains. These are now built in (though I think as C++ functions in the library) to core functions library. The function library is used within various of the core first party workflow tools, as well as within some reporting and tools for macros or apps design. One exception worth noting is the In-DB formula tool – this is a SQL function tool not linked to the formula library. Some of the tools using the formula system and the different operation they perform are listed below. This in not an exhaustive list, I have listed the ones I use but gives an idea of how widespread the function library is within Alteryx. This allows you to perform an operation over all or a subset of the fields, and either create a new field for each (the default) or overwrite the existing field (including changing the type). This can be very useful for data cleansing for example. This allows you to perform the equivalent of a For…Next loop within Alteryx, generating a set of rows for each input row. 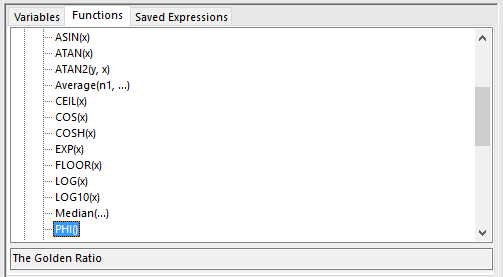 The initial value, loop step and termination expression are all formula expressions. This tool lets you raise a warning or an error on a condition. This condition can be a formula expression. This is a fantastic tool and allows you to add safety checks to joins, etc. We will be using this in the next part of this series for creating test workflows. This tool allows you to take inputs from interface tools and then update the configuration of other tools within a macro or analytic app. We will look at the process to create both of these. In the next post, we will look at creating a simple installer script and setting up some testing workflows. The basic formula tool is the best place to start when wanting to create new functions. This post is based around the current version of the formula tool (as of version 10.6). A new UI was demonstrated as part of the keynotes at Inspire 2016 in San Diego (see George Mathew’s Keynote). As discussed in the previous posts, the UI and the engine are actually two separate DLLs connected via the XML configuration. The engine piece is not being changed (I don’t believe) and all formulas and extension functions should work as before within the workflow. From what I have seen the new UI is a fantastic step forward (and great demonstration of using HTML as the UI piece) – giving both IntelliSense suggestions and syntax colouring much like in Tableau. Category Category name for function to appear under. This can be either one of the existing ones or a custom name. NumParams Specifies the number of parameters. It has a required boolean attribute of variable. For XML Macro functions this must be false. Description Text to display to inform the user what the function does. Insert this block into the XML file. This specifies the function name (PHI), the category (Math) and description (The Golden Ratio)for the function list. If you double click on PHI within the list, it will insert PHI() into the expression box. This function will be replace with the formula ((1 + SQRT(5)) / 2) when the engine evaluates this expression. The NumParams node is specifying that this function takes no arguments. The variable attribute must be set to false for macro functions, this is for C-style DLL functions which we will look at in another post. This block is very similar to the block for PHI. I have chosen to put the IFNULL function with the Specialized category. The formula is exactly the same as we saw in the formula tool above. The only very slight complication is the InsertText element. This is where you can leave placeholders for the parameters for the user to replace. It worth making these descriptive so the user knows what each parameter does. This is as close as you get to providing syntax help to the user. There is a sample workflow for these function you can download here. This workflow will write the add in file to a temporary location and install it on first run. You will get a UAC prompt on this run. You will need to restart Alteryx for it to appear in the function list. Once the add in is installed the UAC prompt wont trigger again. If you wish to uninstall the add in then disable the Installer tool container and enable the Uninstaller tool container. First as we said above, these are just syntactic sugar. They get replaced with their formulae early on in the evaluation of an expression. This being said, they can make you expression significantly easier to read and write. For example, the IFNULL function means you do not need to repeat the first argument, if this is a long expression then this results in a nice simplification. I also believe the argument is only evaluated once so if the evaluation is hard then this can be a big performance improvement. Debugging these add ins can be difficult. Alteryx will not give you any error messages if the XML is badly formed. The add ins will just not load and the functions will not be available in the designer or the engine. I have been playing with creating a XSD (XML Schema) file and then using an online XML validation tool (e.g. http://www.utilities-online.info/xsdvalidation/#.V6-VCZgrIcU) but haven’t completed this yet. Because debugging them are hard – don’t take it too far. In my experimenting with then. I did go as far as to create HexBin functions (based off the d3.js code) in XML (see image below). They took a lot of tuning and playing with to get to working and were impossible to adjust and really understand. I have now re-implemented them as C-style DLL functions. Final mention of some fun and games with recursive calls. I was trying to set up a number of business days function and wanted it to call itself if start was after end. Easy enough to express that in the formula but Alteryx does not like it. It will load the add in quite happily but the second you call the function it will just die! I think the substitution engine cannot cope and while fun to find a reliable way to make Alteryx die (as it is a very stable product), it is trivial to create another function and avoid this issue. I do not believe you can mark a function as internal or private and if you get to much complexity or layers worth thinking about C-style DLL functions instead of XML macros. We have created our first add in. In the next post, I’ll take a look at source control, unit testing and creating an installer.